It is partly because they take up no shelf space. Partly because they are a bit cheaper and you can find odd titles you never see in the bookstores. But mainly I love them because it doesn't matter if it is 1.00 am on a stormy night and you don't want to get out of bed. You can buy a new book and be reading in minutes. Which is pretty much how I ended up reading 100 Deadly Skills on the weekend. It is a pretty cool book. Each skill has a page or two of description and a black and white diagram. 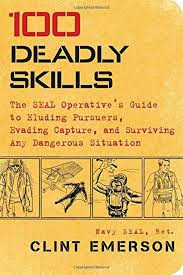 All put together by retired Navy SEAL Clint Emerson and based on years working secret special missions. It is kind like the The Worst Case Scenario Survival Handbook for paranoid people and is squarely aimed at the big boys demographic. No female role models in this book. As a bonus there is a lot about recycling. Making gun holsters out of coat hangers, silencers out of plastic bottles and lock picks out of paperclips. There is a lot of really interesting (and dangerous) stuff in this book. I particularly liked the improvised taser using a disposable camera. There are some useful tips here for the future zombie onslaught. Lets say you are traveling and get stuck in a hotel room when the zeds start appearing. With this book you will know how to barricade your hotel door, make body armour out of bibles and escape the building with a bedsheet rope. Tip - Ask for a King size bed and extra sheets! An entertaining read. I'm definitely getting some Kevlar shoelaces.